Allay your anxieties about performing complex practical procedures under pressure and increase your confidence and competence with Invasive Medical Skills: A Multimedia Approach. 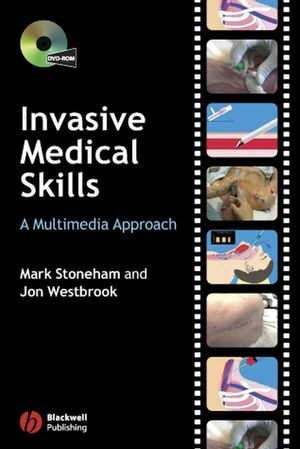 This multimedia package, with DVD and accompanying book, covers all the core invasive medical skills required by senior medical students and junior doctors, including injections, cannulation, airway management, catheterization and chest drain insertion. Equipment photographs of everything required to perform the procedure. Invasive Medical Skills: A Multimedia Approach gives an opportunity to develop in-depth understanding of the principles of invasive clinical techniques and knowledge of how to conduct them safely and comfortably for patients. An ideal product for medical students and junior doctors, it will assist those learning skills for the first time as well as those seeking a visual refresher on skills not frequently practised. Mark Stoneham, MA, FRCA, is Consultant Anaesthetist at the John Radcliffe Hospital, Oxford and Honorary Senior Clinical Lecturer at Oxford University. He spent five years in the Royal Navy and Royal Marines, received anaesthetic training in the South West and Ann Arbor, Michigan. His clinical and research interests are in regional and vascular anaesthesia. Jon Westbrook, MRCP, FRCA, is Consultant Anaesthetist at the John Radcliffe Hospital, Oxford and Honorary Senior Clinical Lecturer at Oxford University. He trained in general medicine before commencing his anaesthetic training in Oxford and the University of Maryland in Baltimore. His clinical sub-specialty interests are in neuro-anaesthesia and neuro-intensive care. From Our Medical Student Reviewers. 2. Putting Up a Drip. 12. Internal Jugular Vein Cannulation. 13. Low Approach to the Internal Jugular Vein. 20. Laryngeal Mask Airway Insertion.